Bolangir: Chief Minister Naveen Patnaik and Union Health Minister J P Nadda on Friday inaugurated the Bhima Bhoi Medical College and Hospital in Odisha’s Bolangir. Inaugurating the medical college, the Chief Minister said this college is another stepping stone towards Odisha government’s resolve towards inclusive and equitable development in the state. A total of 100 students have enrolled for the first batch of the institution beginning this academic session. 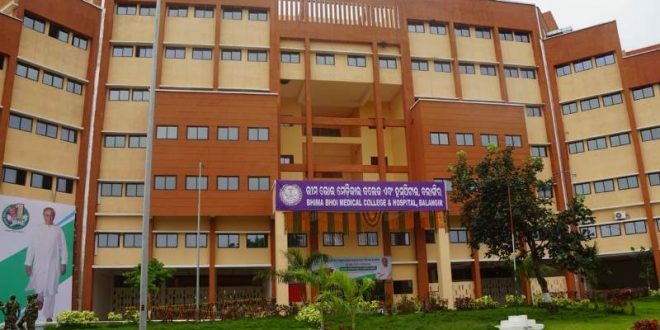 “I hope that this institution will be certainly able to prove to be one of the best medical colleges of Odisha and the long cherished dream of the people of the western Odisha to get tertiary health services and produce excellent healthcare personnel’s would be achieved,” said the Union Health Minister. He said five districts were approved in the state for establishment of new medical colleges under the Phase-I. These are Balasore, Baripada (Mayurbhanj), Balangir, Koraput & Puri and all except Puri have become functional. On the occasion, requested Odisha government to implement the Ayushman Bharat (National Health Protection scheme) along with Biju Swasthya Kalyan Yojana as it will help those seeking medical treatment outside the state. Western Odisha Development Council passed the proposal for setting up the Bolangir medical college and hospital in the year 1999. The Chief Minister laid its foundation stone in 2004. Four MoUs between the Odisha government and different private companies on the establishment of the hospital were cancelled on different occasions for different reasons. Later, it was in 2013 when the Centre announced setting up of four colleges in Odisha following which the foundation laying ceremony was held again in the same year. The new institution has been named Bhima Bhoi Medical College and Hospital as homage to the legendary poet, who preached and propagated Mahima Dharma and professed the philosophy of Sunyabada (nothingness) in the state. The central government had sanctioned Rs 189 crore for the medical college, said sources.